This week I’m working with the code I started last week. I think I’m going to spend some time on this demo to try and make it a proper game at some point in the future. I’ve scaled down the car and it currently has ridiculous acceleration. I’ve added in a ramp that I can drag around. I also brought in spatial mapping so the car will drive on the floor and crash into the furniture. I actually had a lot of fun driving this little car around. It felt a lot like driving an RC car. While this is just a toy, it was fun to play with. This makes me think it is a start for a nice game. I have a couple of game design posts and one of them talks about the difference between a toy and a game. 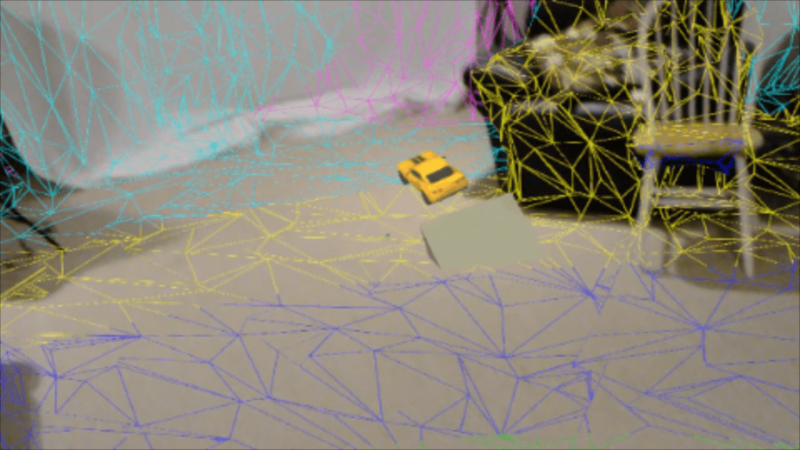 The spatial mapping wireframe changes color based on how far the camera is from that part of the mesh. This is built into the HoloToolkit and I didn’t have to do anything special for it. I want to add in spatial understanding and create a track around the room include jumps that would allow the car to land on surfaces that are considered platforms or chairs or “sittable”. My biggest problem currently is time. Saying yes to something means saying no to something else. Some people say it is saying no to everything else. I don’t quite fall into that group, but only recently have I been thinking about the contents of the book Essentialism by Greg McKeown. It finally became clear that I can’t do everything and there will be tradeoffs. Currently, I’m running the LearnHoloLens.com membership site and creating YouTube videos every week as well as sending out HoloLens and Augmented Reality emails to my fellow code ninjas. These commitments every week mean I can’t do other things like play Forza Horizon 3 or any of my backlog of games. My pile of shame is pretty high, but that is a post for another day.